New Issue! Download Oh Canada! Oh Canada! 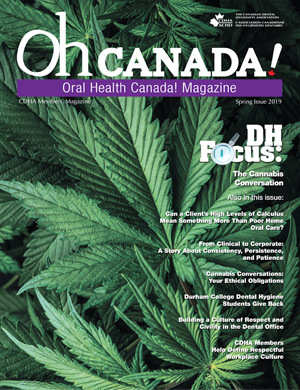 is a non peer reviewed publication that provides a forum for the communication of association news, clinically relevant dental hygiene and oral health information and new product information. Oh Canada! is published three times a year: a print edition in April and August and an electronic edition in December. All issues are available to members only in the archive below. Can a Client’s High Levels of Calculus Mean Something More Than Poor Home Oral Care?